How did the Confusion Arise as to Type of Pentagon? … Finally, if the sides are all equal and x = x’ = 90°, the tessellation in Figure 5 becomes Figure 6 which is shown in Cundy and Rollett and is a favourite street-tiling in Cairo. The illustration clearly shows an equilateral pentagon. In the light of the contradictory in situ pictures which do not correlate this statement, I then made efforts to find Dunn and ask him for more details as to this relatively lightweight report, to see if he could substantiate an equilateral pentagon determination. Upon correspondence (2010), he told me that this was indeed a first-hand sighting, purely upon chance, after arriving at Cairo airport, in Heliopolis, in likely 1969. Furthermore, and more germane to this enquiry, upon asking for specific details as to how he determined that the pentagons were equilateral, i.e. did he actually measure these, he added that he did not but had assumed the pentagons to be equilateral, this being influenced by a diagram (of equilateral pentagons in a Cairo-like diagram) that he had seen in Mathematical Models by Cundy and Rollett (page 63). Thinking little more of it (in retrospect, fairly justifiable, given the circumstances of a chance sighting), he then wrote up the finding in an article on pentagon tessellations per se at a later date, and thus apparently inadvertently started the myth that the tiles are equilateral. To see if my conjecture is likely, I here show the two types of pentagon side by side (Figure1), namely the equilateral and in situ (or my own version, with very much alike angles; the in situ is beyond my capabilities of drawing, the difference is negligible for comparison purposes) and compare. As can be seen, at first glance there is indeed a superficial resemblance, of which upon a cursory glance could easily be mistaken for one another, although the differences are still, or should be, noticeable. The second apparent instance, by Martin Gardner, also oddly (given the contradictory nature of the in situ pictures) gives an equilateral pentagon. ‘… This beautiful tessellation [referring to a diagram of equilateral pentagons] is frequently seen as a street tiling in Cairo and occasionally on in the mosaics of Moorish buildings’. In his account, as with Dunn, Gardner does not directly give a source for this statement. However, in the bibliography for the article he gives two references, one of which quotes Dunn’s article. Such a reference therefore seems compelling that he is slightly rewriting from Dunn, with Dunn’s ‘favourite’ being changed to ‘frequently’. Therefore, it would appear likely at first glance that he is taking his reference from that article. However, this is not necessarily so, as in his account he gives some additional details to Dunn’s account, namely adding ‘and occasionally on in the mosaics of Moorish buildings’. (Further fuel to the general uncertainty is that no such pictures of this have arisen). Dunn makes no reference to this additional aspect. Therefore, a certain amount of uncertainty arises as to whether this is based on Dunn’s account or not. A case can be made for both instances: Yes, in that it echoes Dunn’s account in many, but not all ways. No, in that Gardner gives subtly different detail, as well as additional information. On the balance of probabilities, I think it likely that Gardner is indeed referring to Dunn’s article, with the extra detail ‘… in the mosaics of Moorish buildings’ likely in a picture he has seen elsewhere, and likely (as with Dunn) with not too much attention paid to detail as to type of pentagon. 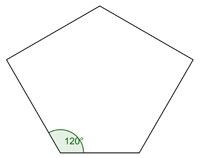 The wholesale lack of equilateral pentagons in the in situ pictures essentially supports this conjecture; it would be remarkable if two independent sources were to make incorrect statements. along with three other references, from Coxeter, Escher and Haag’s usage, but these are not germane to this inquiry, as they do not attribute Cairo to the tiling. Of note is the use of …it is said to appear as a street tiling in Cairo. This is obviously not therefore a first-hand account. However, seemingly as ever with the background to this, there are various uncertainties here. It is not clear as to which (if any) source she is quoting; both Dunn and Gardner are quoted in the article, Gardner directly here, as well as elsewhere) and Dunn in another regard. But nowhere does a reference to the dual occur in their respective articles! …the reciprocals of the tessellations 32. 4. 3. 4 and 34. 6 are patterns of congruent pentagons as are often used for street paving in Moslem countries. Obviously, the term ‘Moslem countries’ is decidedly vague; this could apply to any one (or more) of many such countries. However, what gives substance to my conjecture as to this pertaining to Cairo is that in the following year Macmillan wrote (or more precisely had published) an article in the Mathematical Gazette (see below) in which he stated quite categorically that he had indeed visited Cairo, and indeed refers to street pavings in that. Therefore, it would indeed appear that by ‘Moslem countries’ he does intend Egypt, and by extension Cairo. Proceeding on the conjecture that this is indeed so, of note is the type of pentagon given, the dual. As evidenced by the in situ pictures, there is no corroboration to this statement. So an obvious question is to why Macmillan apparently incorrectly states this. Of course, it is indeed possible that such pavings did (or still do) exist. However, given the evidence, I find this extremely unlikely. One possible explanation here (although I may be doing him an injustice), is that (as with Dunn) Macmillan paid little initial attention to a likely broadly chance sighting, and with his mathematicians’ mind assumed the tiling to be of the dual type. However, against this possibility, the dual bears less superficial resemblance to the in situ tiles than an equilateral pentagon as given by Dunn. Simply stated, the in situ tiles and equilateral are of a long base, the dual a short base; the difference to a mathematician should be obvious. Therefore, an obvious question to ask is to whether a mathematician of Macmillan’s stature would make such a mistake? A lay person unversed in mathematics yes, but would a mathematician of renown such as Macmillan err? It seems most unlikely, but this seems to be the only possible explanation. Certainly, not a single instance of the dual has been found (and neither for that matter the 34. 6!). Another oddity to this account is that the article by Macmillan referred to above then largely disregards the dual, and instead asserts (correctly) that the in situ tiling is one with a condition of collinearity! But again, relative uncertainty remains. In this account, and the subsequent one, Macmillan uses the term ‘often’, rather than ‘invariably’ or ‘always’ in regards to the appearance of the in situ tiles, and so he leaves a little here to interpretation. ‘Often’ does not mean ‘necessarily’. There again, perhaps I am reading too much into this, with such a focussed approach on a single word, with the possible accusation of pedantry. However, would Macmillan be so slack in choice of words; it would seem unlikely, but there the evidence is for this. Be that as it may, likely as this account does not directly detail Cairo and its paving, I have not been able to find a single reference to this (Schattschneider’s dual reference does not refer to this), and so it would appear unlikely that this has influenced those who quote the dual. To see if my conjecture is likely, I here show the two types of pentagons side by side (Figure 2), namely the in situ paving and dual and compare. As can be seen, these are decidedly different with only superficial resemblance, certainly more noticeable than Figure 1. Would Macmillan mistake these for each other? It seems most unlikely given the differences, but that is the only conclusion to draw. And this so this would apparently finally and correctly establish the type of pentagon, this echoing the collinearity found in the in situ pictures. However, once again, this is not necessarily so! Of note is that Macmillan refers to the collinearity aspect as ‘…often adopted…’ but not ‘always’ or ‘invariably’ as might otherwise have been put if there was indeed just a single instance of this type. Are there indeed two (or more) types as could be surmised from this? Therefore, he thus in as sense vacillates here; does he mean always collinear here or not? Likely, given the pictures, this was just a slip on choice of words on his part, in which he intended always. (But that said, would someone of Macmillan’s stature as regards thoroughness and exactness err here? Of note is that in the same article (page 253) he uses ‘often’ again, in the context of colouring. Here, there are indeed more than a single instance of colouring, and so ‘often’ (being more than one instance) is thus used correctly here.) Certainly, the pictures and sightings back up this conjecture as to his meaning being ‘always’. I now have over 50 distinct sightings, in a variety of locations in Cairo, of which these are of two types, in a square matrix, or of individual pentagons, but all are (or can be surmised, in the case of the square matrices, which have complications as to being sure of intended collinearity) of collinearity. Beyond all reasonable doubt, he intended ‘always’ here. Therefore, with numerous pictures, and furthermore in a variety of locations, to hand, I now consider the confusion is largely explainable, in that this now all largely fits into place. I conjecture that every reference as regards the pentagon being equilateral or dual subsequent to the above is taken directly from Dunn, equilateral, Gardner, equilateral (the most likely, given that his account in Scientific American is by far the most popular and accessible source) or Schattschneider, dual, and is thus repeated blindly without due reference to seeing the in situ tiles, and taken as fact. Indeed, that situation is bad enough. But this shortcoming is compounded by some very careless cross referencing, in that both the incorrect types are frequently quoted, and so someone should have noticed a discrepancy. And it gets worse! This is further compounded in that amazingly, no one seems to have taken cognizance of Macmillan’s (correct) account; I cannot find a single reference to his article (see addendum)! This is somewhat surprising, given that although Gardner’s account in Scientific American is by far the most popular and accessible account, one would still have thought that most academics would have ready access to the Mathematical Gazette in which the article appeared. Just for general interest, I show below references where the author asserts, or indicates, in the form of an accompanying diagram the type of pentagon; equilateral, dual, or collinearity.